The cheapest train ticket I could get for my return journey from Amsterdam to London was a departure at around 5pm, meaning I had to find things to do in Amsterdam for a whole day. There are worse places to have to spend a sunny day touristing and I was even more fortunate that it fell on one of the two Heritage Days held every year. Buildings and monuments are opened to the public with volunteer guides providing information. The first Open Monument I encountered was the Makelaers Comptoir – the office of the Guild of Intermediaries). 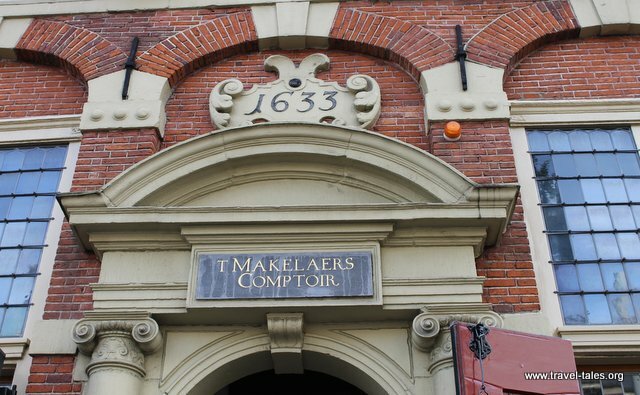 It was built in 1633 to represent the ‘makelaers’, an independent specialist establishing contracts between suppliers and their clients. The profession got a bad reputation in the middle ages and was forbidden, until in the 1600s the increasing trade and wholesale of coffee and tobacco made them necessary again. They were initially appointed by the Dutch government and were allowed to form into guilds from 1612 onwards. In the entrance hall there is a big sign of all the members and their crest, some of which more obviously representing their surnames than others. I was in Amsterdam the day my house flooded. The place is almost finished now. Glad it’s nearly back to normal!